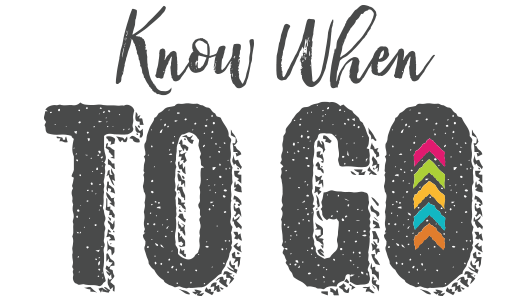 Whether you’re driving, bicycling, walking or riding a transit, it’s essential to know when to go – when it’s legal to go AND when it’s safe to go. 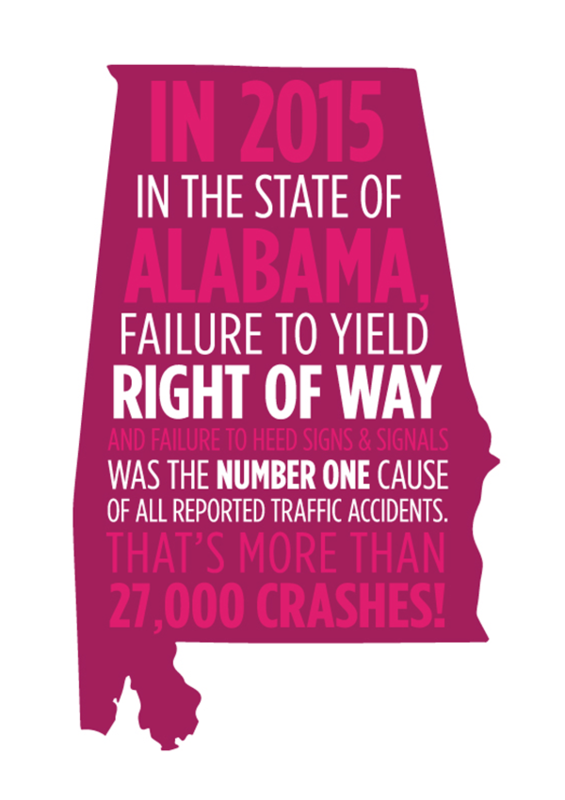 Failing to yield right-of-way is a common issue that can have serious consequences. What does yield mean? To yield means to slow down and to observe the environment around you. 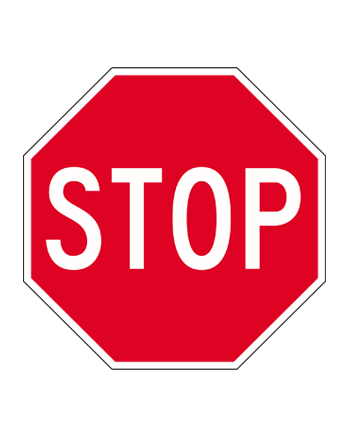 If you need to stop due to oncoming traffic, a crossing pedestrian or any other obstacle, stop. If the coast is clear for you to continue, continue. Yielding is all about YOUR safety. 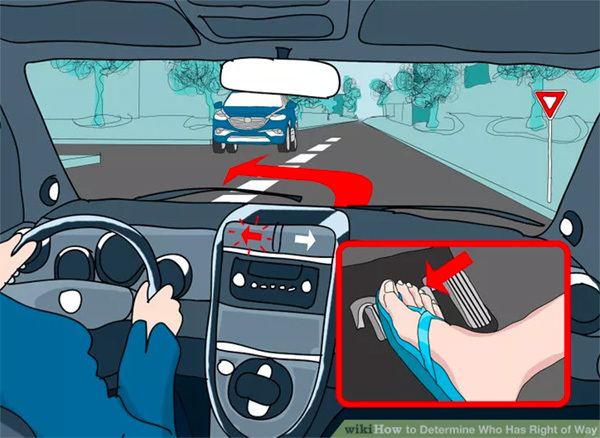 When you fail to yield right-of-way, you take a risk that puts you and the other travelers (drivers, bicyclists and pedestrians) in potential danger. In any yielding situation, make sure you #KnowWhenToGo. “Left Turn Yield on Green” Sign Courtesy Manual of Traffic Signs, by Richard C. Moeur. When you want to turn left and another driver or bicyclist wants to turn right or go straight, you must yield right-of-way. Right-of-way is always given to the vehicle operator who doesn’t have to cross oncoming traffic lanes, unless there is a yield sign for the traffic turning right. We’ve all learned that “green means go,” but at an intersection with a traffic light, you’re only protected to make a left turn when a green arrow is illuminated. When a green ball is illuminated, you’re permitted to make a left turn only if there are no cars, bicyclists or pedestrians blocking your path. Every now and then, the traffic lights at an intersection will be set to flash in one color. A flashing red light is the equivalent of a stop sign, and a flashing yellow functions like a yield sign. In these instances, be aware that the lights on one side may flash yellow while the other side flashes red. Just because you may be required to stop does not mean all other lanes are instructed to do so. Proceed through any intersection with flashing lights cautiously. When the traffic lights are all dark, treat the intersection like an all-way stop. 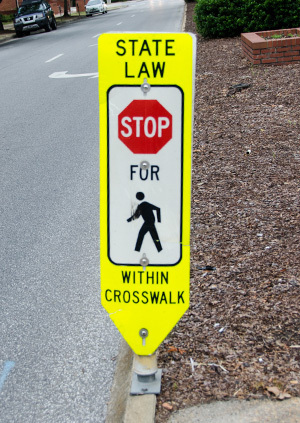 At a crosswalk, it can sometimes be confusing to determine who has the right-of-way, but here’s a simple rule of thumb. 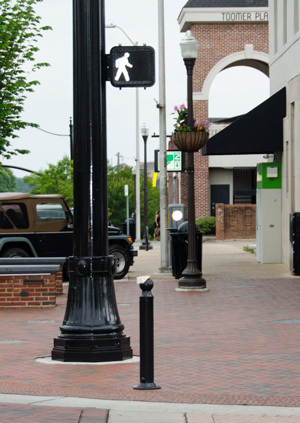 If you’re a pedestrian, you have the right-of-way when a pedestrian signal gives you the go-ahead. 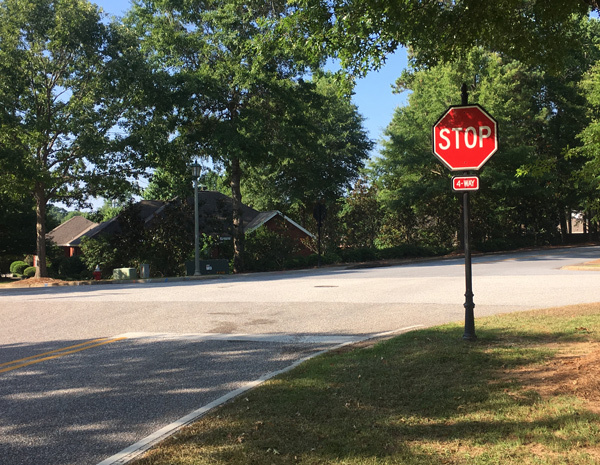 When there is no pedestrian signal present, you have the right-of-way when the street is clear for you to begin crossing without causing a driver or bicyclist to slow down, even on campus! 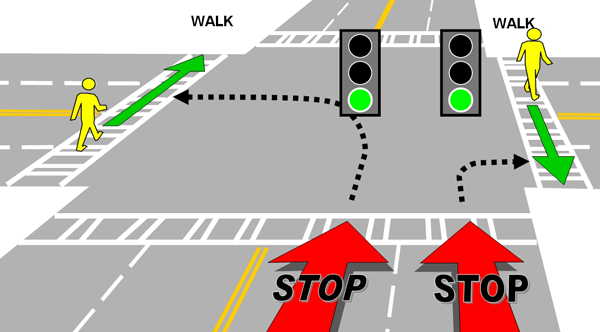 You also have the right-of-way at 4-way stop intersections. 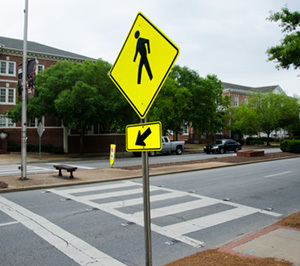 If you’re a driver or a bicyclist, you must obey all traffic signals and yield the right-of-way to pedestrians who are already within the crosswalk. Also make sure the intersection is clear before turning! The “right hook” is one of the most hazardous and startling failure-to-yield scenarios for bicyclists. A “right hook” occurs when a driver making a right turn cuts off a bicyclist who is continuing straight through the intersection. If you’re the driver in this situation, you must yield right-of-way to the bicyclist by law. 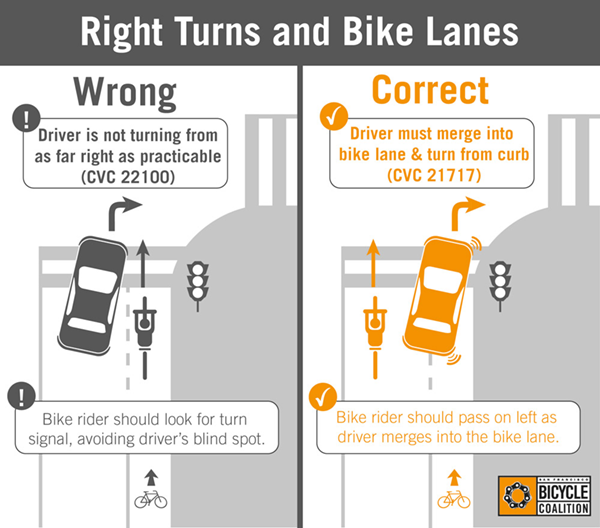 Before turning, always check your blind spot for any bicyclists approaching from behind. As a bicyclist, make eye contact with the drivers around you and give deliberate body language to let them know which direction you’re headed.